This fabulous fish pie will bring out your inner architect. Fun to create, it proceeds by stages, none of them difficult thanks to the advent of high-quality commercial pâte feuilletée (puff pastry). You will need two large (pie-size) rounds, your oven’s broiler pan and a sheet of parchment paper. 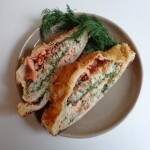 The six fillings — dilled rice, salmon, spinach, cod, mushrooms and smoked salmon — are prepared separately. And then you begin to build. Begin with the fish. Bring the wine to a simmer in a skillet. Add the rosemary and peppercorns. Simmer the cod until it is just barely cooked. Remove, flake and set aside in a small bowl. Repeat with the fresh salmon, using the same cooking liquid, and set aside in a second small bowl. 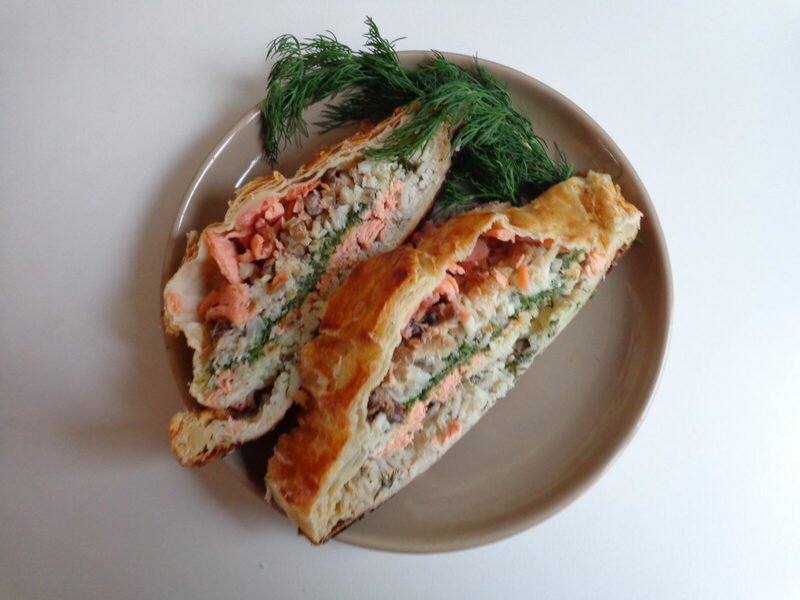 Slice the smoked salmon into bite-size pieces and set aside. Combine the rice and water in a saucepan, add 1/4 tsp. salt and bring to a boil. Reduce heat to a simmer, cover and cook for 10 minutes or until done. Remove from heat. Add 1 tsp. butter and 3 tbsp. chopped fresh dill. Grind in some black pepper. Taste and reseason if necessary. Set aside. Cook the spinach, drain thoroughly and add 2 tbsp. cream, 1/4 tsp. salt and some freshly ground black pepper. Set aside. Rinse the mushrooms, spin or pat dry, pare and slice. Peel and mince the onion. Bring 1 tbsp. olive oil to sizzling in a frying pan. Add the chopped onion and stir-fry until wilted, about one minute. Add the mushrooms and sauté, stirring occasionally, until they have given up and reabsorbed their juices. Remove from heat. Stir in 1 tbsp. cream, 1 tbsp. chopped fresh dill, 1 tsp. lemon juice and salt and pepper to taste. Set aside. Preheat your oven to gas mark 6 (400 F, 200 C). 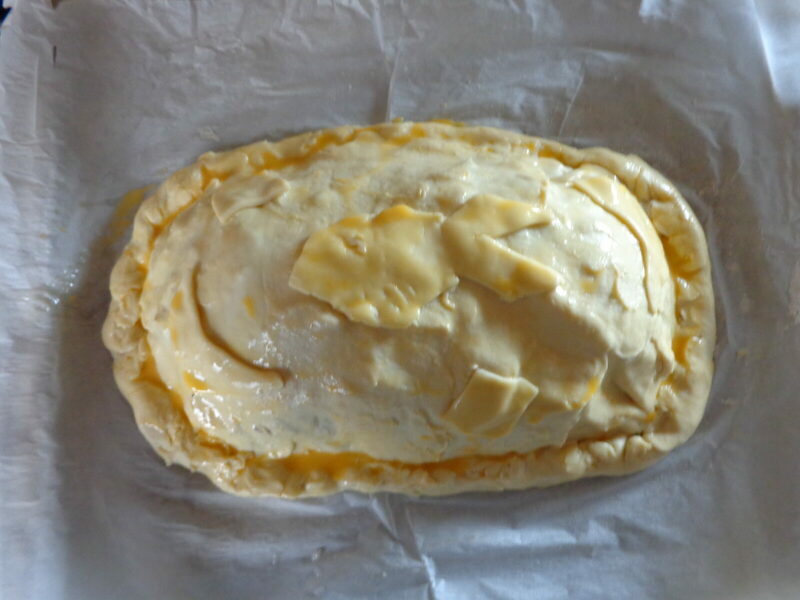 Remove one packet of pastry from the fridge. Unroll. Cut a slice from each side to make a large oval. (Reserve the bits of pastry that you have cut away — you will need them later to decorate the pie.) Place a large sheet of parchment paper on the broiler pan of your oven. Transfer the pastry oval to the parchment paper. Measure 3 tbsp. breadcrumbs or, if you don’t have any, crush 2-3 biscottes (zwieback slices) with a rolling pin. 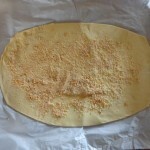 Scatter the breadcrumbs over the pastry, leaving a margin of about 1 inch (2.5 cm) all around the oval, as shown in the photo. 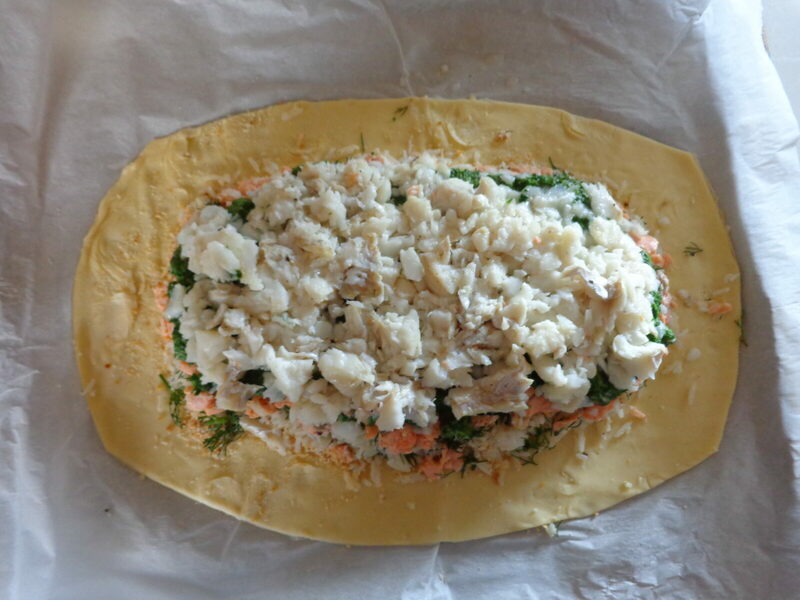 You will now begin building your fish pie in layers, respecting the margin around the edge. First comes the rice, right to the edge of the margin. Cover the rice with the cooked salmon. Next comes the spinach. 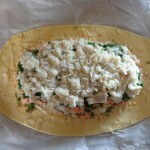 Layer the cod on top of the spinach, as shown in the photo. Top the cod with the mushrooms. Add the final layer — the smoked salmon. 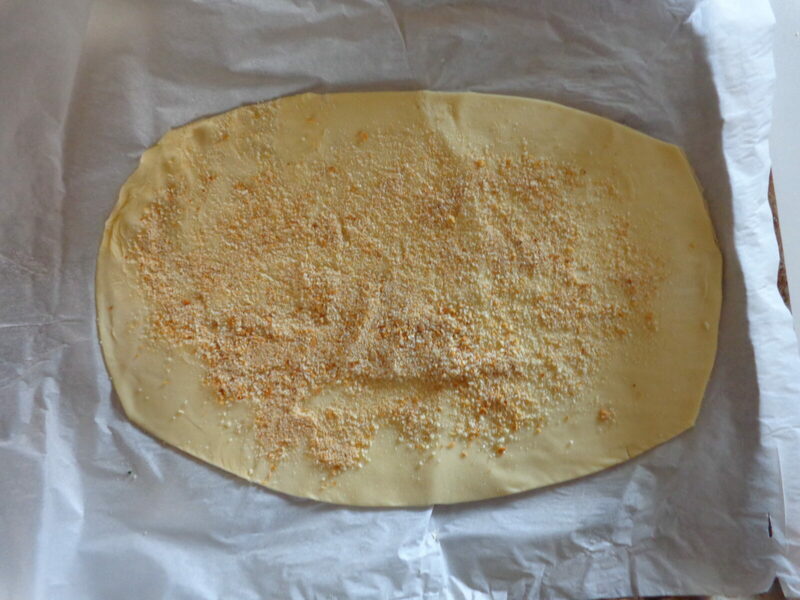 Remove the second packet of pastry from the fridge, unroll and cut out a second oval, slightly wider than the first. 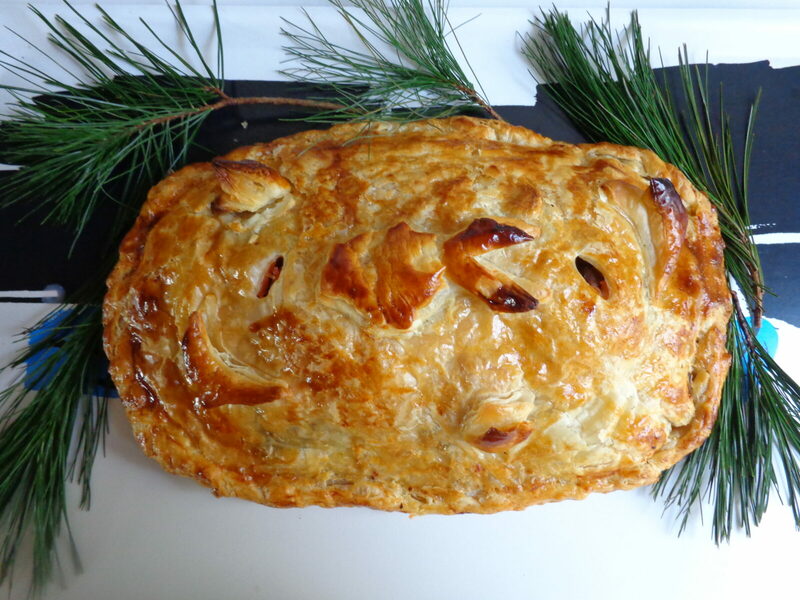 Drape this oval over your pie. Pinch the edges together tightly, rolling the edge of the bottom layer up and over the edge of the top. Crimp to form a decorative border. 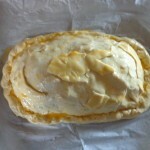 Slice into the top of the pie in 2 or 3 places to create holes for steam. Mix the egg yolk with 2 tsp. water to make a glaze. Paint the glaze over the entire pie. Using the pastry left over from your ovals, cut out decorative shapes and place them on the pie. Glaze again. Place in the oven and bake for 40 minutes, or until the pie is golden brown. Serve piping hot in slices with a fine white wine. Serves 4-6. Looks wonderful. Is there any way to make the components the day before and assemble and cook when ready to eat ? Thanks for all the great ideas. Good question. The answer is yes! You can prepare all of the ingredients for the filling a day ahead of time and store them in the fridge until you’re ready to assemble the pie. That should be done just before you intend to bake it. Happy holidays, and thanks for the vote of confidence!